I like this quote that says so much about Claudette Colbert; but the Academy Award-winning actress has nothing to do with the recently opened restaurant called Claudette. A casually elegant script spells out the restaurant’s name. The restaurant takes its name from a 91-year-old woman from the Provençe region of France. Claudette is the mother-in-law of Reine Sammut, the chef at La Fenière in Lourmarin, France. This is where the owners of the restaurant, Carlos Suarez and Mark Barak enjoyed a superb meal in the autumn of 2013. Mr. Suarez and Mr. Barak were so impressed that they sent Claudette’s chef, Koren Grieveson to work with and learn from these French culinary masters. The three French doors at Claudette are opened in good weather. A portion of my view, reflected in one of the two dining room mirrors. As for the heavy-handed use of garlic that Monsieur Dumas writes about, I did not taste any in my beet and baby arugula appetizer or the Ratatouille Tarte I enjoyed as an entrée. Too bad, because I do like garlic! There must have been a pound of butter in the tart’s crust. Not that I am complaining; it was divine. The topper for me though was my dessert: rich, scrumptious cardamom-flavored gelato! My dining companion thought his appetizer of grilled baby squid was “yummy.” He enjoyed his chicken tagine with bulgur and harissa, a hot Chili pepper paste (this entry is an example of the North African and Middle Eastern influence on the menu). His dessert, Pistachio Cake with lavender honey cream and candied orange, was uniquely satisfying. Bread is not automatically brought to the table; ask and ye shall receive. A detailed view of the bar at Claudette. The rusticated, farmhouse-style dining room is cool, comfortable and welcoming. It is decorated in the colors of Provençe, with hand-painted tiles, and a floor made of wood from a 200-year-old barn (Bravo! to repurposing materials). We dined here in mid-July, when the three large French doors are opened to the sidewalk of the Gold Coast, as Lower Fifth Avenue is known. We were seated at a corner banquette, giving us a sweeping view of the room. The spot was perfect; but not so much for a couple arriving later. The banker-like husband said he did not want to stare at the wall during the meal. I suspect he did not want to look at his elaborately coiffed and bejeweled wife the whole time! The service is excellent. Our waiter, Ecuadorian Juan, was not only efficient he was very entertaining. He would casually slip in amusing remarks throughout the meal. His humor was the extra special ingredient added to each dish. He really had me LOL! 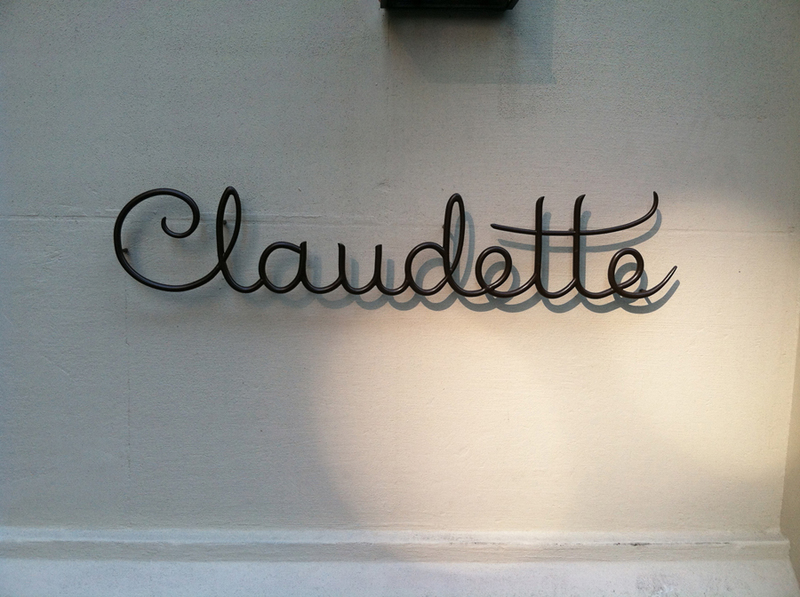 For me the entire dining experience at Claudette was delightful. The surroundings were charming. The wait staff was helpful. The food was excellent. The hand-painted tiles cover the wall leading to the kitchen. I hope that the owners have another hit on their hands. They have already scored big with their other Greenwich Village culinary ventures, Rosemary’s and Bobo. I hope that Claudette follows that trend. Located on the ground floor of the apartment house at 24 Fifth Avenue, Claudette could break the run of bad luck for this space, which has seen restaurants come and go all too quickly. You can reach Claudette in several ways. Ride bus numbers 1, 2, 3 or 5 directly down Fifth Avenue. Exit at the 10th Street stop; walk one block to the corner of Ninth Street and Fifth. Or, ride the #1 subway train to Christopher Street; walk along Christopher, against the traffic, to Sixth Avenue, which you will cross to West Ninth Street, and walk one block. Or ride the #6 local subway train to Astor Place; walk along East Eighth Street, against the traffic, to Fifth Avenue. Walk one block up Fifth Avenue, again the traffic, to the corner of Ninth Street and Fifth Avenue. Or, you can hail a cab! Claudette’s phone number is 212.868.2424; I recommend reservations. Find Claudette on the world wide web. The Greenwich Village Walk Tour passes Claudette, Rosemary’s and Bobo. A broader view of the bar at Claudette.